Zucchini Paratha is a flatbread with an Indian twist and a perfect breakfast or brunch recipe. Added some pickle and taste was great. Zucchini is a summer squash which is harvested when immature. It is a thin-skinned and dark or light green in color. Zucchini is treated as a vegetable, usually cooked as a savory dish or accompaniment. I added grated zucchini and made a flatbread which is great for a meal or after school snack for kids. To make zucchini paratha I added grated zucchini along with chopped onion, pickle and green coriander. Knead and make a soft dough. Roll parathas and serve with curd or raita. I served these with curd and mushroom masala. So let see how to make this lip-smacking zucchini paratha. First of all, clean and grate the zucchini and measure it for two cups. Do not squeeze its water. It will help to knead the dough and less water required for kneading. Peel if you like I added with green layer and did not peel. In a mixing bowl add all the ingredients and combine them well. Rub everything together. It will help to absorb moisture from all wet ingredients. Slowly add water to make a dough. Do not keep it. Start making parathas as soon as your dough is ready. Zucchini leaves water and dough will become soggy. Divide the dough into equal parts. I made 9 naans with this dough. Heat a griddle on medium heat. Dust the rolling surface and roll into a 5-6″ circle. Transfer it to the hot griddle. Flip it on another side in few seconds and apply oil. Cook from both sides until it is golden brown. Zucchini paratha is ready to serve hot with curd. Do not allow the dough to sit for some time. It will become soggy. I also notice grating also impact the taste and texture of the dough. If it fine grating then no zucchini is seen in the dough and required less water to knead. If you grate from the bigger side of the box grater then bits n pieces are visible and required more water to knead. 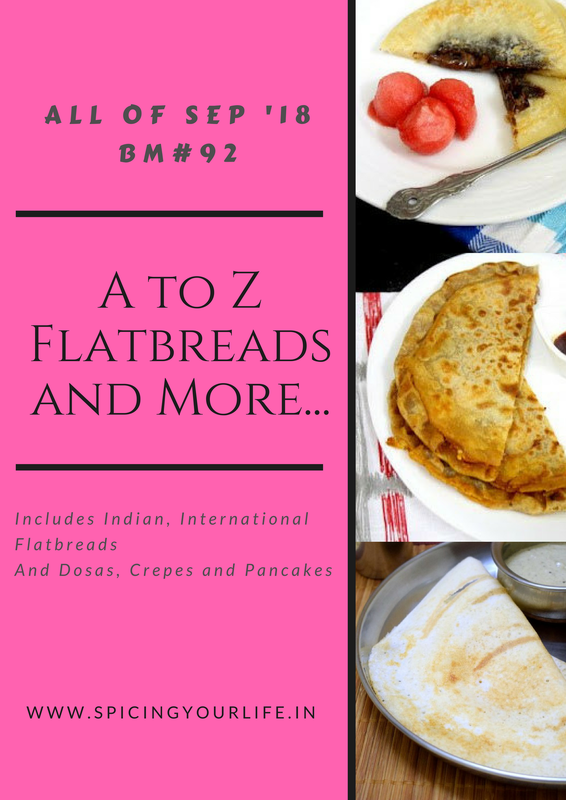 It is all very simple Indian flatbread which is ready in no time. Zucchini Paratha is a flatbread with an Indian twist and a perfect breakfast or brunch recipe. Added some pickle and taste was great. yeah zucchini paratha taste great and kind of bottle gourd paratha. We love zucchini and this is a great recipe to make for lunch boxes. I will try this when I buy some zucchini next time. I am sure zucchini must have blended so well with flour for these rotis..great way to include this vegetable. parathas are one dish that can taste good with any vegetable added to it. Thanks for liking zucchini paratha. yep it was first time I made them but totally enjoyed. Another tasty and healthy paratha. I too make this often. Is it not a good meal and a very easy way to make eat fussy kids. Thanks for liking Zucchini paratha. Thanks Suma for liking my zucchini paratha recipe. Yummy paratha Bhawana adding zucchini and pickle too. An ideal breakfast paratha. Congratulations on completing your first Mega BM. I’m sure for the next one you will be prepared and come up with awesome recipes. Thanks lot for encouraging. It means a lot. Same pich Bhawana. I too made something similar and added carrots to the dough. Your version also sounds delicious! Thanks PJ, I love with the variation we can make with any Indian recipes. These parathas with zucchini looks amazing Bhawana. Today it is raining zucchini and each recipe is so unique. This one sounds so flavourful. Thanks dear for loving zucchini paratha. Love the idea of adding pickle to the dough.. Am sure this paratha will definitely my kind of food. Well done Bhawana, its been a while i made zucchini paratha, will add pickle definitely in my dough this tome. Thank u for this idea. Thanks Priya for appreciating this zucchini paratha. Zucchini parathas sound delicious , I am sure they taste fantastic with pickle masala , what a lovely twist to the paratha . Thanks di for liking zucchini paratha. Zucchini parathas…look delicious and inviting to munch ! Thanks Neeraj, yeah actually this broccoli-cauliflower paratha taste awesome. Adding pickle to the dough along with zucchini is a cool idea. I am sure the flavors pop out well in a paratha. Good choice, Bhawana. yeah, if I dont get what to make by default add some pickle in flour. Thanks Sowmya, for liking zucchini paratha.